"We waste our money so you don't have to!" "We waste our money, so you don't have to!" Three Movie Buffs was born on June 2nd, 2000. 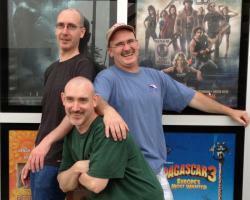 It was the brain child of Eric, Patrick, and Scott Nash; three brothers with a love of movies who, not satisfied with pressing their opinions about movies onto their families and friends, wanted to share their opinions with the rest of the world. This website is the result. After more than 16 years and many thousands of reviews later, the site was retired. This then is an archive of all those reviews and articles that were written over those years.